Connaught Place is one of the largest financial, commercial and business centers in New Delhi, India. It is often abbreviated as CP and houses the headquarters of several Indian firms. It was earlier the headquarters for the British. Its surroundings occupy a place of pride in the city, counted among the top heritage structures in New Delhi. It was developed as a showpiece of Lutyens’ Delhi featuring a Central Business District. Named after H.R.H. Field Marshal The 1st Duke of Connaught and Strathearn, the construction work was started in 1929 and completed in 1933. The Inner Circle of Connaught Place was renamed Rajiv Chowk and the Outer Circle was renamed Indira Chowk by Union Home Minister S.B. Chavan. Today, Connaught Place is one of the most vibrant business districts of Delhi. It is the fourth most expensive office destination in the world, according to global property consultant CBRE Group and the fifth highest priced market in the world according 2013 Forbes list. Recently, while stumbling upon the History of Connaught Place, I found a few images from the late 90’s. Those were Black and White images and such images are often not clear and does not portray the actual atmosphere as well as the look and feel of that place. 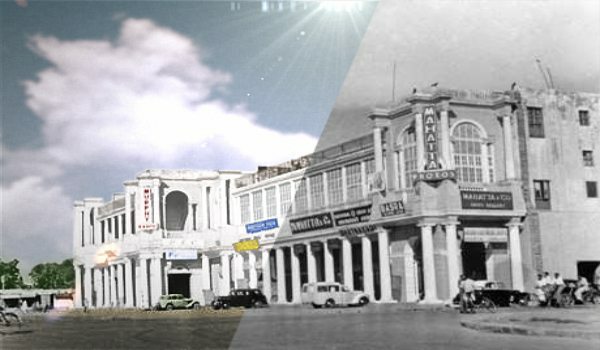 So, I decided to colorize a Photograph of Connaught Place which was taken back in 1945. 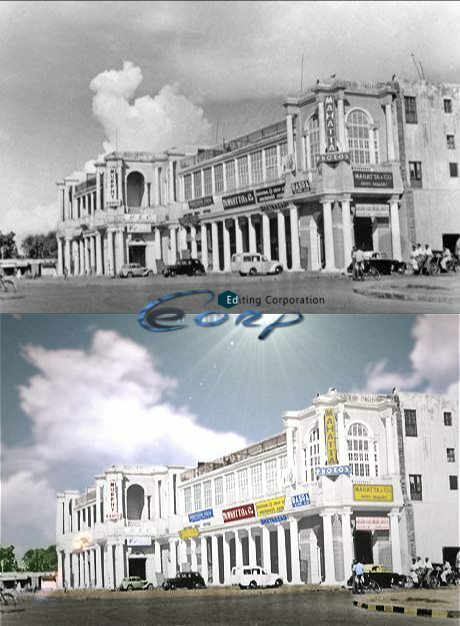 Though the colorization is not so perfect since the image quality was too low, still you can see and feel how Connaught Place was at that time. Check out the final Before and After Image below. I used After Effects to colorize the image using Adjustment Layers, Masks, Tint Effects and Curves Adjustments. I also replaced the clouds in the image. I matched the grains of the actual photograph with the replaced sky image so that it looks blended and finally did color correction and grading.